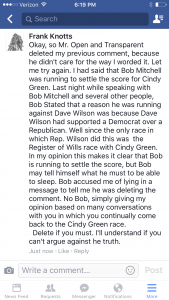 One would expect a candidate running for a state office, like Representative, to have a bit thicker skin than does one Bob Mitchell. 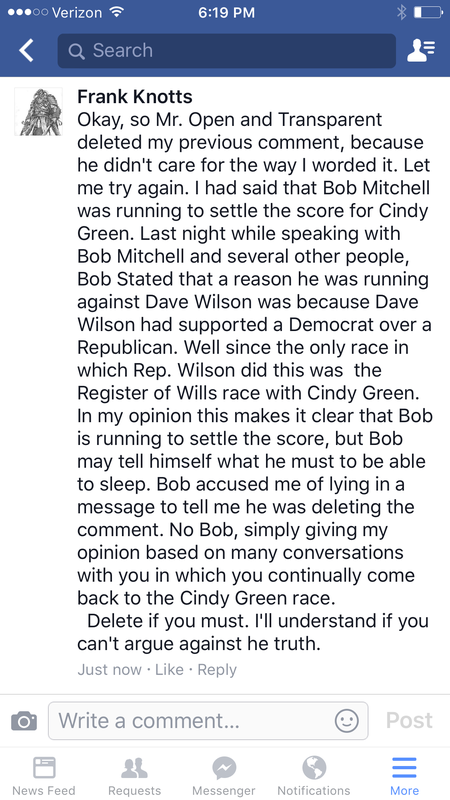 You see, on many occasions I have had conversations with Bob Mitchell, in the presence of others, where he can’t help talking about how his primary opponent Dave Wilson supported the Democrat, over the unqualified Cindy Green, in the Register of Wills race in 2014. He makes continued references to it. In my opinion he is in this race simply to settle the score for the Greenwood MOB. He of course denies this completely. Well last night at the 35th RD meeting, again in the presence of others, Mr. Mitchell brought up the issue of Rep. Wilson’s support of Ms. Green’s opponent. He stated he had a serious problem with it, and was asked if that was why he was running, to which he answered, “yes”. Mr. Mitchell had no problem debating behind the scenes in messages, after he had blocked me from his page. But would not do so openly. 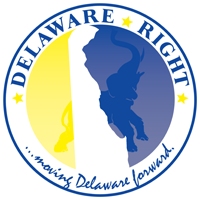 One can only wonder the kind of legislator he would make, if he had a chance to win. Seems all of his deals would have to be of the backroom sort. Unlike Mr. Mitchell, I welcome him here and on my Facebook page where I have posted a similar comment on his cowardly behavior. He wants to run for office, yet he can’t seem to defend his own words. He also blocked another person for challenging him about his opposition to funding public education funded within the state budget. Seems to be a pattern. 8 Comments on "Chicken Bob"
Many people should consider blocking you. You are a disgusting shell of a man, an attack artist and a very poor writer. Still carrying you huge Bowie knife on your belt? I wonder how Frank can at the same time be empty inside AND an attack artist. Do settle on one, Danny. He hates Frank so much, he needs to make sure he reads everything Frank writes. The food is terrible, and the portions are too small. Interpretation: I’m not just a random anonymous commenter on a blog, I know you and you know me and I wanted you to know that which is why I added a completely off the wall sentence that means nothing in context of the topic. But I’m not going to tell you who I am. I want to keep you guessing because I believe that it intimidates you. True Dave, it also shows a lack of knowledge about knives. It was not a Bowie , it was a K-Bar. You always need to carry a knife in Bridgeville. You never know when you’re going to confront a stubborn pack of scrapple. Well Rick once again speaks about that which he has no personal knowledge. Rick the issue of my wearing the K-Bar began after I came to a monthly GOP meeting directly from work and I didn’t take it off. Anyone who knows the K-Bar knows what a wonderful all around tool it can be, not just a knife, I found it extremely useful in my work. The striking thing is how much is made of me wearing a knife openly. By the same people I might add who say they are strong proponents off the 2nd Amendment. The hypocrisy is endless among theses little brains.